There is great excitement in the Vallée d’Aulps this week as the big contenders for the Tour de France seek to test their form in a gruelling eight day stage race across the Alps. The Critérium du Dauphiné, widely regarded as the second most significant of the French stage races (though the organisers of Paris-Nice might disagree), is traditionally used as the warm up to July’s Tour. Previously known as the Dauphiné Libéré, the race was first run in 1947 and traverses the mountainous regions of the Rhône-Alpes. In each of the last eleven years the wearer of the Yellow Jersey in Paris has used the Dauphiné to fine tune their form. The Portes du Soleil is one of the major sponsors of the race, reflected in the parcours of recent years. In 2012 the race arrived in Morzine over the fearsome Col de Joux Plane; this year the race creates a little piece of history by starting outside of France for the first time, in the nearby Swiss resort of Champéry. With the exception of Nibali, fresh from his victory in this year’s Giro, all of the pre race favourites for July will be on the start line on June 2nd, including Contador, Rodriguez, Sanchez, Valverde and of course Chris Froome. French favourites Pierre Rolland – an outside bet for the podium in July, and widely tipped as France’s next grand tour contender – and the effervescent Thomas Voeckler will provide local fans with something to cheer. World champion Tony Martin will be hopeful that he can honour the rainbow jersey in Wednesday’s individual time trial – particularly given the absence of two time defending champion Bradley Wiggins, still to recover from the illness and injury that forced him to abandon his attempt to add the maglia rosa to the maillot jaune he collected in Paris last year. As one would expect from an Alpine race, there is no gentle prologue. Sunday’s first stage begins with the climb of the first category Côte de Morgins, before descending into France and heading down the valley towards Lac Leman. 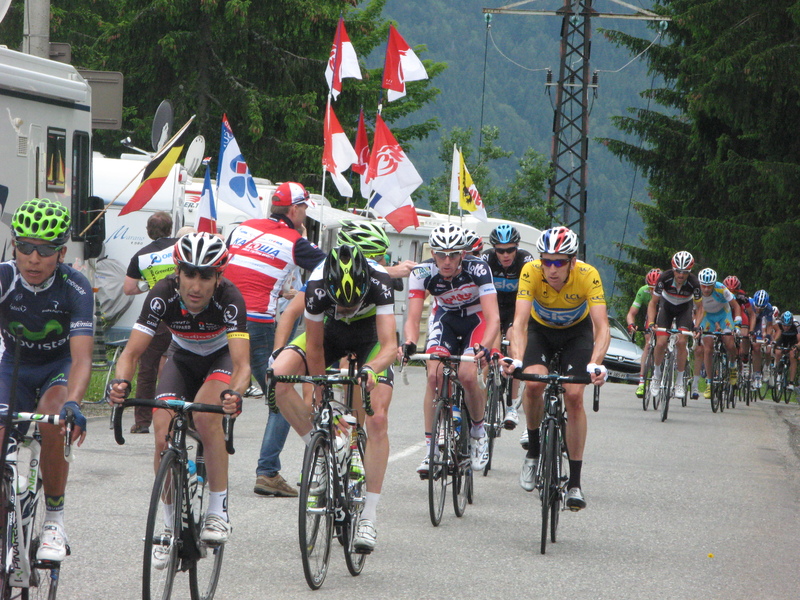 The riders will then turn up the Vallée d’Aulps, before tackling the first category Col du Corbier – a climb familiar to many riders from the final stage of the 2012 Dauphiné. Though the climb itself is just six kilometres long, the final three kilometres average 9% – a serious test for the riders with some fifty kilometres of the stage remaining. Following the twisty descent into Bonnevaux and the Abondance Valley, the riders will pass once again through the ski resorts of Chatêl and Morgins, before finishing with the short, sharp climb back into Champéry. Britain has an astonishingly good record in the Dauphiné – its four wins (Brian Johnson, 1961; Robert Millar, 1990; Bradley Wiggins 2011, 2012) in the event bettered only by the cycling powerhouses of France (thirty wins) and Spain (ten wins). With Chris Froome – and Sky – in such dominant form in the early season stage races, who would bet against a fifth a week on Sunday?